Live the GMOA Experience at SXSW! You may have already read my blog GMO Answers Leaves an Impression at SXSW but I wanted to share some great videos from our time at South by Southwest. Just to recap: GMO Answers recently went to SXSW to talk with consumers about their questions and concerns about GMOs and how our food is grown. At the GMO Answers booth we brought the farm indoors, featuring corn, canola and cotton plants on the expo floor, for attendees to experience first-hand and inspire open, transparent conversations about high-tech crops – check it out! 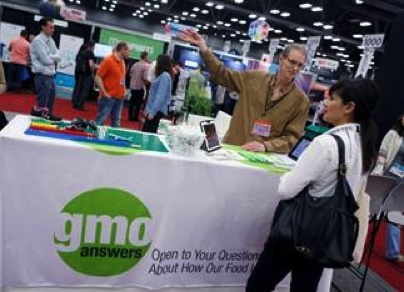 Farmers, nutritionists, as well as independent and company scientists from around the U.S. and Canada volunteered to staff the GMO Answers booth and answer attendee questions about GMOs. Click here to meet the experts who were onsite. Additionally, visit our video wall for a firsthand look some of the conversations that took place in the GMO Answers booth. Lastly, SXSW attendees also stopped by the booth to participate in our live, in-person version of a Reddit Ask me Anything (AMA). Reddit moderator, Victoria Taylor, moderated a panel discussion with Cathleen Enright, Ph.D., Brian Scott, a corn, soybean, popcorn and wheat farmer, Connie Diekman, nutritionist, and Dan Randolph, Lead Biologist, Traits, Genetics, and Technologies at Dow AgroSciences. You can watch the AMA session by clicking on the video below. The conversation is also available on Reddit here. Relive the GMOA experience at SXSW here.